Dr. Bryan Mohr and his wife, Julie, purchased the existing veterinary practice, Matchett Veterinary Clinic, from Dr. B.J. Matchett in 1992. 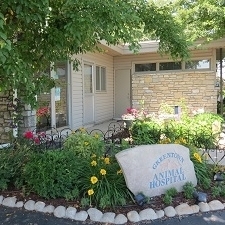 The Mohr's renamed the clinic Greentown Animal Hospital and, since seeing their first patient in July of 1992, have strived to offer quality veterinary care for dogs and cats in Greentown Indiana and surrounding community's including Kokomo, Russiaville, Marion, Tipton, Windfall & Peru. We believe that in order to achieve this goal we must employ educated and friendly staff with strong pet bonds, family values, and great people skills. In order to educate our clients on the best veterinary medicine for their pets including heartworm & flea prevention, vaccines and preventative medicine. We value our clients and the pets they share with us. Above all else, we wish to provide up-to-date medical, dental and surgical treatments, advice, and gentle, loving veterinary care so that our clients may have healthy dog and cat companions with them for as long as possible.